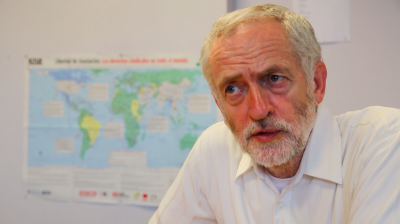 A future Labour government under the leadership of Jeremy Corbyn (image above) would almost certainly reinstate the law on Universal Jurisdiction that was amended by the previous Cameron government in order to facilitate the entry into Britain of Israeli politicians and military personnel without fear of arrest for alleged war crimes. That contentious action was taken by the then Conservative Foreign Minister, William Hague, in order to accede to the demands of Binyamin Netanyahu and the Israeli government, and against the opposition of UK human rights groups. The re-instatement of this important piece of human rights legislation would bring Britain back into line with most of Europe where those alleged guilty of war crimes can be arrested pending trial. The current suspension of this law in Britain has since enabled various members of the previous and/or present Israel government to visit the UK and to travel freely within the country to raise funds and/or disseminate propaganda to support the policies of Likud Prime Minister, Netanyahu, without fear of apprehension by the authorities. There is certainly a strong feeling that a reversal of that erroneous policy is now well overdue in order to maintain Britain’s obligations to respect human rights and the International Court.